We have a English dub trailer for the next Dragon Ball movie, Dragon Ball Super: Broly. It's coming out one month after the film comes out in Japan this December. So, we get it in January 2019 in theaters, really that's the fastest we've ever got a Dragon Ball movie dubbed in America. 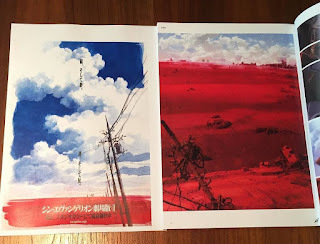 In some big news not out of Comic-Con, Evangelion 4.0, if that's what it'll even be called, is coming out in Japan 2020. The last film came out in Japan in 2012, we got it later. It was 2014 when it was in theaters here and didn't see a release on DVD/ Blu-ray until 2016. So, Japan might get it in 2020, but us...let's hope Funimation makes a deal as good as they did with Dragon Ball. The reason the last DVD/ Blu-ray took so long was because those who make Eva over in Japan are kind of perfectionist. The sub has to capture the correct meaning of the words to the original in English and though you may think it's a lot of people working on getting that done, there's probably not a huge staff doing that. Funimation doesn't get to just do their in-house subbing or send it off to a third party, it takes an insane amount of time. Hopefully, we get a sub in theaters a few months after Japan in 2020 and then it may well be a year or years before a dub and streaming version for English speakers. Let's hope the same voice actors from the three other Fun dubs are still working.